against the Mount Allison Mounties. The Lady Tommies defeated Mount Allison this evening 3 to 1 to earn themselves a tie with the Mounties for fourth in the AUS standings. Julia Sharun was lights out fantastic facing 41 shots for the win. 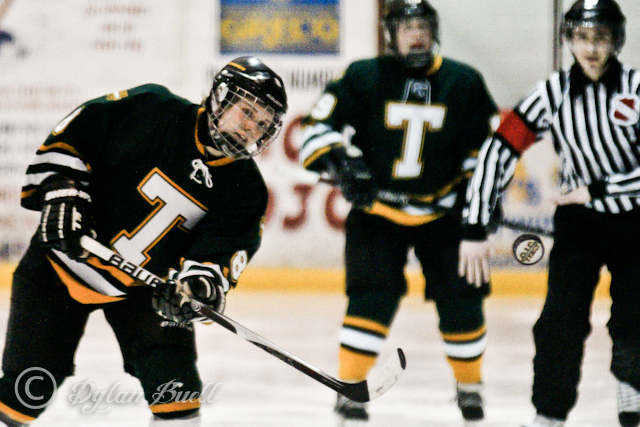 The Tommies got the game off on the right foot when Katie Brewster blocked a shot, scooted in on a breakaway and scored unassisted at 1:27. Jordan Miller (MacIsaac, McTaggart) would get a goal just one second after a MT. A penalty expired at 18:23 to send the Tommies into the intermission up two goals. Shots were 12 - 10 in the first for STU. The second period was all Mount Allison and if not for the amazing goaltending of Julia Sharun, the Tommies would have been in big trouble. The Mounties scored 24 seconds into the period but Shurun shut the door the rest of the way facing 21 shots in the period. In the third, Sharun continued to shine and Captain Kayla Blackmore, from behind the goal line, scored only 12 seconds into the period for a little insurance. STU would make it stand up and win the proverbial 4 point game and now sit one point behind UPEI for 3rd position in the AUS. St. Thomas will head to Alberton, Prince Edward Island tomorrow afternoon to take on the UPEI Panthers in a playoff style show down. No broadcast is available and do not expect any updates from this one. We'll share any news we get, as soon as we get it. GO TOMMIES GO! !